"We should bring forth fruit unto God"
The precursor to the University of Malta was the Collegium Melitense, a Jesuit college which was set up on 12 November 1592. This was originally located in an old house in Valletta, but a purpose-built college was constructed between 1595 and 1597. This building is now known as the Old University Building or the Valletta Campus. The Jesuits were expelled from Malta in 1768, and although their property was taken over by the Treasury of the Order of St. John, the college remained open and professors retained their posts. The University of Malta officially came to existence on 22 November 1769, when Grand Master Manuel Pinto da Fonseca signed a decree constituting a Pubblica Università di Studi Generali. The University was briefly suspended during the magistracy of Francisco Ximenes de Texada in the 1770s, but it was reconstituted by his successor Emmanuel de Rohan-Polduc in 1779. The University was replaced by the École Centrale during the French occupation of Malta from 1798 to 1800, but was once again reopened by the British in the early 19th century. From 1937 to 1974, the institution was known as the Royal University of Malta. Over time, the Valletta campus became too small and Evans Laboratories (now known as Evans Building) was built in 1959 to house the Faculty of Science. In 1968, the Medical School moved to a building near St. Luke's Hospital in Gwardamanġa. The University opened a much larger campus at Tal-Qroqq in Msida in the late 1960s, but it retained the Valletta building which is still used for some lectures and conferences. The administrative set up of the university comprises academic and administrative and technical staff members who are appointed or elected to the governing bodies of the University. The principal officers of the University are the Chancellor, the Pro-Chancellor, the Rector, the Pro-Rectors, the Secretary, the Registrar, the Deans of the Faculties as well as the Finance Officer and the Librarian. The main governing bodies are the Council, the Senate and the Faculty Boards. As the supreme governing body of the University, the Council is responsible for the administration of the University. Faculties group together departments concerned with a major area of knowledge, while institutes are of an interdisciplinary nature. The council is also responsible for appointing staff members to academic posts. The senate is largely responsible for the academic matters of the University primarily regulating studies, research, documentation and examinations at the University. The senate also establishes the entry regulations. The faculty board directs the academic tasks of the faculty. The board presents plans and proposals to the senate and the council. Besides, it determines the studies, teaching and research within the faculty. The administration rebranded the university for the fall semester of 2017 with a stylized version of the logo that removed the Latin motto “Ut Fructificemus Deo” (“We should bring forth fruit unto God”) for daily use and retained it in a version to be used in ceremonial contexts; some faculty objected to removing the motto. Admission to the university is based on Matriculation examination results (A levels), grades are awarded on a seven-point scale. Grade 1 is awarded for the highest level of achievement, whereas Grade 7 indicates the minimum satisfactory performance. However, entry on basis of maturity and experience is granted for certain courses in the arts and sciences. The Faculty of Dental Surgery allows for a maximum of six European students per year chosen according to merit and only after the students have passed an admissions interview. There are 11,500 students including 750 international students from 82 countries, following full-time or part-time degree and diploma courses, many of them run on the modular or credit system. The university hosts Erasmus and other exchange students. A basic Foundation Studies Course enables international high school students who have completed their secondary or high school education overseas but who do not have the necessary entry requirements, to qualify for admission to an undergraduate degree course. Over 3,000 students graduate annually. There are a further 2,500 pre-tertiary students at the Junior College, which is also managed by the university. The university has fourteen Faculties, a number of institutes and centres and the School of Performing Arts. The floor area occupied by the library building is between 5,000 and 6,000 square metres. A collection of one million volumes is housed throughout the Main Library, branches and institutes. The library subscribes to 60,000 e-journals, 308 print journal titles and a collection of e-books. The main campus is located in Msida, with an area of 194,000 square metres and which houses the majority of the faculties, centres and institutions. There are also campuses at Valletta and on Malta’s sister-island, Gozo. The Valletta Campus, which is housed in the Old University Building, dates back to the founding of the Collegium Melitense and incorporates the Aula Magna ("Great Hall"). The Valletta Campus also serves as a setting for the hosting of international conferences, seminars, short courses and summer schools. It is the venue of the university International Masters Programmes, the Research, Innovation & Development Trust (RIDT) and the Conference Unit. 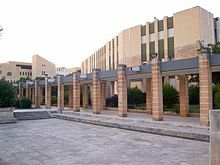 The Gozo Campus (formerly known as the University of Malta Gozo Centre) was set up in 1992 with the collaboration of the Ministry for Gozo. The administration of the University of Malta Gozo Campus supports the organisation of part-time degree, diploma and short-term courses in Gozo and also caters to the needs of students from Gozo who study on the main campus. The campus provides a venue for public lectures and seminars and houses the Güsten Atmospheric Research Centre, within the Department of Geosciences. The centres comprise the Centre for Biomedical Cybernetics; Centre for English Language Proficiency; Centre for Entrepreneurship and Business Incubation; Centre for Environmental Education and Research; Centre for Labour Studies; Centre for Literacy; Centre for the Liberal Arts & Sciences; Centre for Molecular Medicine & Biobanking; Centre for Resilience & Socio-Emotional Health and the Euro-Mediterranean Centre for Educational Research. The University of Malta has also set up a School of Performing Arts. The Cottonera Resource Centre acts as a hub that co-ordinates links between communities in the inner harbour area and the University, facilitating resource-transfer and capacity building. There is a University of the Third Age. The campus is home to the IMO International Maritime Law Institute (IMLI). The university is a member of the European University Association, the European Access Network, the Association of Commonwealth Universities, the Utrecht Network, the Santander Network, the Compostela Group, the European Association for University Lifelong Learning (EUCEN) the International Student Exchange Programme (ISEP) and the Excellence Network of Island Universities [RETI]. The university has participated in EU programmes and has won several projects in collaboration with partner universities. University of Malta staff and students participate in programmes such as Erasmus and Leonardo. The university acts as a partner with other institutions. Links have been forged with the Chamber of Commerce, Enterprise & Industry and the Employment & Training Corporation in order to determine how the university, industry, business and the public sector can develop links. Student societies include the Malta Medical Students' Association (MMSA), an association of students in the faculty of Medicine and Surgery which is a full member of the International Federation of Medical Students' Associations (IFMSA) and European Medical Students' Association (EMSA). The Malta University Holding Company Ltd. (MUHC) embodies the commercial interests of the University of Malta. The companies comprised in the Holding Company serve as the commercial interface between the University of Malta and the business community, brokering the resources and assets of the university to provide added value through commercial activity. ^ The Association of Commonwealth Universities. "University of Malta". Archived from the original on 14 April 2012. Retrieved 11 February 2012. ^ a b c "History of the University". University of Malta. Archived from the original on 6 January 2018. ^ a b c d "History on the University of Malta Valletta Campus". University of Malta. 20 January 2015. Archived from the original on 9 January 2018. ^ Times of Malta. "Alfred Vella elected University Rector". Retrieved 19 March 2016. ^ Ganado, Philip Leone (October 4, 2017). "Academics lambast new university logo as traditional motto is removed". Times of Malta. ^ "MATSEC Examination Requirements / Regulations - AUFacts". AUFacts. Retrieved 2017-02-07. Lectures on the Statutes of the Sacred Order of St. John of Jerusalem - KIT. p. 20-24. This page was last edited on 20 April 2019, at 01:14 (UTC).